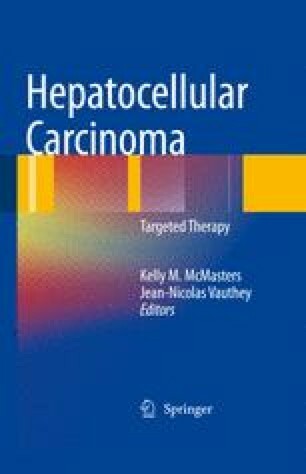 Despite better understanding and advances in oncology, the best available therapeutic option for the management of hepatocellular carcinoma (HCC) is surgical – either liver transplantation or resection. Liver transplantation appears most attractive since it treats the primary tumor and the field defect associated with the underlying liver disease. However, this option is feasible only when there are an adequate number of organs available and when the disease and patient meet certain stringent criteria. Most centers abide by the Milan criteria  to determine candidacy for liver transplantation. These are a single tumor ≦5 cm, two or three tumors all <3 cm, absence of major vascular invasion, and no extrahepatic disease. Unfortunately, only a minority of hepatoma patients fit these morphological parameters. Many other cirrhotic patients do not fulfill the requirements for transplantation due to comorbidity or psychosocial reasons.